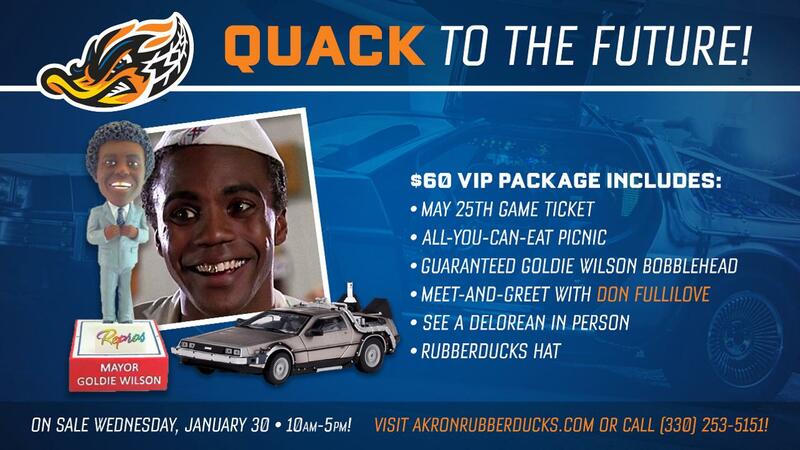 (AKRON, OHIO) Jan. 30, 2019 - The Akron RubberDucks announced today a one-day "QUACK TO THE FUTURE" flash sale for TODAY from 10 a.m. to 5 p.m. for May 25 when actor Don Fullillove, who portrayed Mayor Goldie Wilson in the "Back to the Future" movie franchise, visits Canal Park, along with a Delorean! The package is available by calling 330-253-5151 or by visiting akronrubberducks.com. This special $60 VIP PACKAGE includes a GAME TICKET for the 6:35 p.m. game against the Richmond Flying Squirrels, an ALL-YOU-CAN-EAT PICNIC, access to the exclusive MEET-AND-GREET with Fullilove where they can get autographs and photos with Hill Valley's favorite mayor. They also receive a guaranteed voucher MAYOR GOLDIE WILSON BOBBLEHEAD, a RUBBERDUCKS HAT, and a chance to CHECK OUT THE DELOREAN and become your own Marty McFly! "With next year's mayoral election on the horizon, we thought it was the perfect time to let our fans know a famous mayor is coming to town in 2019," said RubberDucks General Manager Jim Pfander. "We couldn't be more excited to welcome 'Mayor' Goldie Wilson from 'Back to the Future to Canal Park on May 25." That night's game will also include post-game fireworks with a "Huey Lewis and the News" theme. When: TODAY from 10 a.m. to 5 p.m.
How to Purchase: Call 330-253-5151 or visit akronrubberducks.com starting at 10 a.m.